I was in an agent’s office recently, and the phones were mostly silent. I asked her if that was usual, and she explained that whilst that time of year tends to be pretty quiet, this year it seemed to be slower than ever. She looked worried. “I’m really hoping for a good surge next month,” she commented, “we just don’t have any stock”. Are you experiencing the same thing in your office? 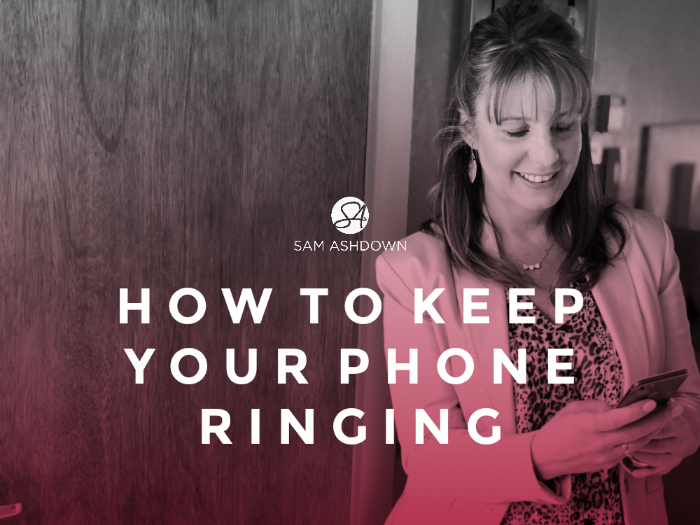 Have your phones stopped ringing? We spent the day creating a Lead Generation Plan, which, though it won’t generate instant results, will however help get stock levels back up to where they should be over the next two or three months. Do you have a Lead Generation Plan? This is a systemised plan for generating and capturing leads from every source you have available to you. I’ve identified 27 different sources of potential leads for agents, both offline and online. Get it right, and you could bring in a new lead from each one of those 27 areas every month, and more. Make a list of all the routes to market that you have available to you. I’ve identified 17 – how many can you find? For example, canvassing, print advertising and networking. If you’re struggling, brainstorm with your team to see if you can find new opportunities. Once you have your routes to market, and your goals mapped out, it’s time to plan out what you are actually going to do to reach your targets. For example, let’s say you were going to plan an event. You might identify seven steps you need to take in order to make your event a success, including ‘Find venue’, ‘create invites’ etc. These steps need listing, and the responsibility for each one allocating to the most appropriate person – probably not you! Time to get organised. I suggest an Excel spreadsheet for this task, as you can lay out your marketing activities on a month-by-month basis, and chart your progress. Along the top of the spreadsheet, add each month, and down the left hand side, list all the routes to market you identified in Step One. so you can chart your progress as you go along. The best way to do this, is to assign responsibility for carrying out the activities in your Lead Generation Plan to a very efficient member of your team. Arguably, this is the most important task in your business, so choose this person wisely. Make them your Implementation Manager and decide on a (generous) incentive package if your goals are met by the end of the year, or whenever your timeframe dictates. This last step is probably the most vital step, and the least applied. It’s where your good intentions can be supremely successful, or an abject failure. If the only obstacle between your current property drought and your phone ringing off the hook, is selecting the right person to take responsibility for your plan, and empowering them to carry it out, then what are you waiting for?